Do you believe in Plane Magic? Did you know that when there is lightening the airport ground crew are not allowed to be on the tarmac? It makes sense, I had just never thought about it before. But I thought a lot about it on a recent flight to Colorado where this storm changed plans for the hundreds of people on board. After each strike, they have to wait 15 minutes to ensure the safety of the ground personnel and that’s how we ended up being stuck in the airplane for almost 3 hours after we landed. The flight attendant was wonderful as she explained the ‘rules’ for a situation like this. (Watch the first few minutes of this video if you want to see a demo). “Actually, I’m a choir director.” he said. “A choir director! Even better – you could lead us in song! !” I was smiling at the thought of this. “They wouldn’t be able to hear me.” he said. “I’m sure you could use the PA system.” I was smiling at the thought of this. “I’ve never done that before.” he said. “There’s a first time for everything!” I was still smiling at the thought of this. The energy on the plane was changing, every time there was a new lightening strike, we knew our wait was lengthened. If things stayed the same, the energy would just get worse and worse and that wasn’t going to help anyone. BUT – if ‘Christopher the Choir Director’ took charge, surely the energy in the plane would shift and that would be what people would talk about when they (eventually) got home. 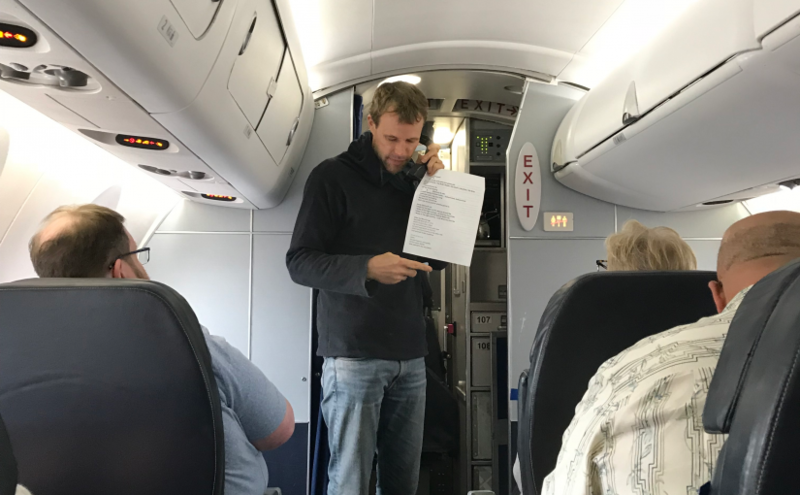 I didn’t give him any time to change his mind, I marched straight up to the front of the plane and told the flight attendant we had ‘Christopher the Choir Director’ on board. She didn’t skip a beat – she picked up the PA, paged him, announced to the passengers what would be happening and everyone clapped him up to the front of the plane. Up he came, with papers in hand and a tuner on his phone – considering this was an impromptu show, he was pretty darn prepared! Not only did this guy guide us in song – he guided us in three part harmony – what?!?! Uh-huh he did and it was awesome and fun and inspiring and maybe even a little bit crazy. But sure enough, energy shifted, spirits lifted and the delay was put in the back of our minds for a few minutes – we were drawn together for a common cause and together we created a little bit of plane magic. Did he give us a gift? Did he do us a favour? Did he view this as an opportunity? I wonder what percentage of the population would have said yes to this opportunity? I wonder how many would have stepped up, taken a risk, put themselves out there? What would you have done, ya know assuming you were a choir director? Say yes to fun, say yes to challenge, say yes to experiences, say yes to making a positive difference! Saying yes, it’s just one more way to live Your Life, Unlimited! PS – for more about this professionally trained Jazz musician, spiritual teacher, environmental and social activist, holistic nutritionist and philanthropist visit http://ChristopherFleck.com. This entry was posted in Happiness, Motivation, Newsletters, Positivity and tagged e-news, happiness, Inspiration, Motivation, positvitiy, Stephanie Staples, travel, Your Life Unlimited. Bookmark the permalink.